Welcome to the June 2013 THHN Newsletter. If you’re looking for places to visit and fun events to take part in, then read on…. we have some fantastic THHN events taking place in June that we’re sure you’ll love. We think you’ll agree we’ve got something for everyone this month. Thank you, as always, to everyone who goes to these events to support us. We’ll be at various ones of them with our great THHN gazebo so, if you see us out and about, please come and say hello. This lovely sunshine means that our fab beach hut is getting lots of use this year which is great. Let’s hope the sun shines on all the events this month, as well as all those on a THHN holiday! Gwen is the THHN’s wonderful secretary. As well as being Mum to two little boys, Gwen also works one day a week at a local primary school teaching a class of Reception children. She is then kind enough to give some of her spare time to the THHN. Gwen took the role on in September 2012 after, she says, having watched admiringly from afar. Gwen saw the huge amount of effort put in by others and wondered what she could do to help. When Luke told her that the charity needed a secretary it seemed the perfect way for Gwen to offer support – a job she could do in the evenings. Gwen writes and sends all the thank you letters and certificates to our many supporters who have helped out in all sorts of ways. She also sends out all the information leaflets to the various organisations around the country that refer families to the THHN. Gwen really enjoys volunteering and feels that she spends her spare time doing something worthwhile. We are very lucky to have her and she does a fabulous job. On Sunday 23 June the annual Hanbury’s Fish and Chips Music Festival will take place in the Festival Marquee up on Babbacombe Downs. David Hanbury has very kindly chosen the THHN as the charity to benefit from the day again this year and we are incredibly grateful to him for that. The event starts at 12 noon. Simply buy your takeaway Fish and Chips from Hanbury’s in Princes Street then take up them to the Festival Marquee on Babbacombe Downs and enjoy them whilst being entertained by a host of great acts including 3 Bags Full, Lucky Guy & The Chancers, Shamrock and many others. Special thanks for supporting this event must go to Babbacombe Garage, Riviera Mortgages, WBW Solicitors, South West Water, the Rotary Clubs of Torquay & Babbacombe, Palm FM and all the very kind people and businesses who have donated prizes for our tombola, raffle and auction. We will be selling raffle tickets in the weeks leading up to the event, and at the event itself. Our Gazebo will be outside the marquee come along and have a go at our tombola or try your hand at the great Cornish game of Smite. We would like to wish all the very best of luck to all of the runners from Winners 2000 and around Torbay who are running in the Torbay Half Marathon, raising vital funds for THHN on Sunday 23rd June. We value each and every single one of your support! Remember look out for the team THHN runners and give them a big cheer when you spot them, we have around 50 runners, so lots of cheers to give! Whilst we’re all enjoying ourselves eating fish and chips and soaking up the atmosphere on Babbacombe Downs THHN founder Luke Tillen will be recovering from a day spent attempting to run 69 miles along Hadrian’s Wall. This is the latest event in Luke’s trio of runs, all part of his big fundraising campaign to help build the THHN bungalow. To find out more or to sponsor Luke’s runs pop along to his fundraising page at www.justgiving.com/Luke-Tillen. On Wednesday 19th June THHN will have a stall at the Fayre on Babbacombe Downs, along with our T-shirts and Wristbands we will be selling homemade cards, photo cards and photo prints, come along and see us. With so many events this month and throughout the summer we are always in need of prizes for auctions, draws, tombolas etc. If you are in a position to donate anything you think would make a good prize please get in touch with us. E-mail fundraising@thhn.co.uk. Thank you. 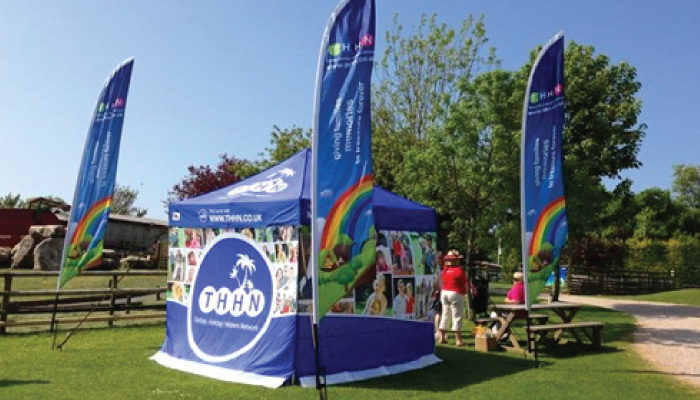 June 19- Babbacombe Charity Fayre.THHN will have a stand on Babbacombe Downs. June 23 – Torbay Half Marathon. E-mail fundraising@thhn.co.uk if you’d like to take part. June 23 – Hanbury’s Fish and Chips on the Downs Music Festival.See above. July 13 – Summer Holiday Ball at the Toorak Hotel in aid of THHN. Tickets are £30 each from the Toorak. Tel 01803 400400 for more info. EE 5 Peaks Challenge team who completed their incredible target of climbing Ben Nevis, Scafell Pike, Snowdon, Slieve Donard in Northern Ireland AND Carrantuohill in the Republic of Ireland peaks in just 53 hours 57 minutes raising over £650 for the THHN – amazing. Marine Hotel in Paignton who welcomed a family from Barnardo’s this month. They also raised a fabulous £1790 holding weekly raffles over the Christmas period. Hotel De La Mer who looked after a family from the Rainbow Trust and another from Rainbows Children’s Hospice. Chad Harper and his brother Johwell from Hip Hop Saves Lives in New York for doing some great photo shoots in THHN t-shirts. Brunel Manor who gave a much-needed holiday to a family referred by CLIC Sargent. Arthur Christian and Emily Knapman who ran our fundraising stall at the wonderful Dean Court Vintage Rally. Thanks too to the organisers of this lovely event. Devon and Cornwall Police Exeter Control Room who had a charity day for us on 10 May and raised an impressive £650. Atlantis Holiday Apartments who welcomed a family referred by CLIC Sargent. Riverford Organic Home Delivery, Luscombes Butchers, Hallets the Bakers, Claire’s Cakes, Over the Rainbow Cake Design, Steers Greengrocers for the gorgeous hampers we are then able to give our visiting families. Robbie Nicholl who completed the Tewkesbury Half Marathon in just 1 hour and 44 minutes and raised an incredible £375 for us. Ashley Court Hotel who welcomed a family referred by CLIC Sargent. Buckfast Abbey Self-Catering who also hosted a family referred by another branch of CLIC Sargent. All the local eateries and attractions that helped us give one of our “home from home” weeks to a local family who can then eat and gain entry to all sorts of great places. Angela and John Bunce who ran a stand for us at the Annual Spring Fete at the Alphington Sports Centre in Exeter last Bank Holiday Monday. Linda Gray at Temple Spa who is now offering her wonderful treatments free of charge to our visiting families – the perfect treat.